Posts about creating printed circuit boards. This set of short articles will show you a making of a PCB, from the initial requirement stage, through the design and manufacture and to final software programming. If you are new to PCB making, I am hoping this text should paint some basic picture of what is involved in a home board design and manufacture. If you are already an experienced hobbyist, I hope you will find some parts informative or interesting enough to try them yourself on your next project. If you see anything wrong, or have a better way of doing it, please post it in a comment. I will appreciate learning from you and sharing the experience! 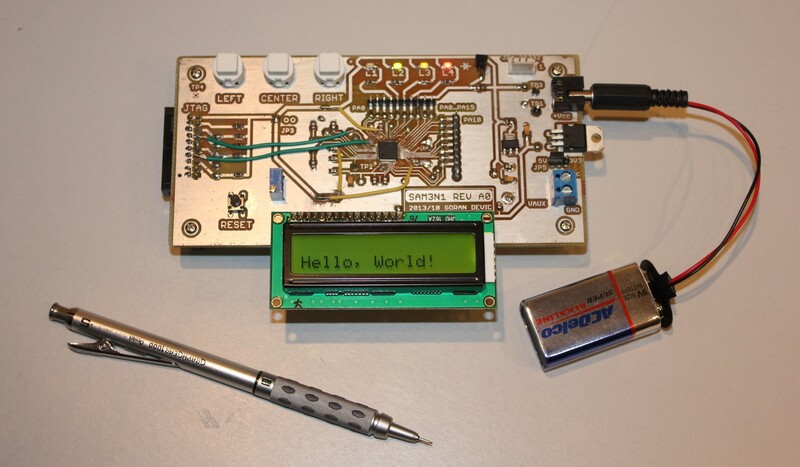 ...continue reading "PCB Making: 1. Introduction"
This is a step of looking for an idea or the purpose of what a board should be doing. You will likely know what you need and then build a suitable board. I needed to build something useful so I can look forward to it once it was done: I wanted to be able to interact with it but also use parts that I already have at home. ...continue reading "PCB Making: 2. Get Started"
The software I use to create board schematics and layouts is Eagle CAD. Software-wise, I also use git version control: I frequently version and commit all changes to project files and then upload them to a cloud server. I like GitHub and BitBucket servers which are free. My suggestion is to always version your work and to always backs it up. ...continue reading "PCB Making: 3. Schematics"
When you switch to Eagle’s layout editor, all the components are going to be grouped together in a corner. Yellow lines (“airwires”) will connect pins. A good way to start untangling that mess is to separate and group components that belong to each design block. For example, the power block contains 7805 and a couple of caps and connectors or terminals. Then you can move them around as groups and play with the placement to get a feel of where they would fit on the final board. ...continue reading "PCB Making: 4. Layout"
Before placing (expensive) transparency into a laser printer, I do several test prints using a regular paper. When you print a transparency mask always invert the TOP layer so that the ink die is close to a board when sandwiched and the thicknesses of a transparency foil is not in the way => print with MIRROR option checked. BOTTOM: select (2) Bottom, (17) Pads, (18) Vias, (20) Dimension. Do not print with MIRROR. ...continue reading "PCB Making: 5. The Mask"
I am using presensitized FR-4 boards. You can also buy something called, “paper phenolic” board; I don’t have experience with those. I used to buy boards from a local Fry’s but lately I just pre-order them from any eBay listing (China) where I can get several for the price of one. ...continue reading "PCB Making: 6. Cut a Board"
...continue reading "PCB Making: 7. Expose and Develop"
There are several kinds of etchants; I am using Ammonium persulfate solution from MG chemicals. It comes as loose powder or crystals. The content releases gasses over time, so you should punch a small hole on the lid of its plastic bottle. These are dangerous and corrosive chemicals, so use a lot of common sense when working with them. There are several variables in the process which you can try to control for the most efficient etching. The goal is to have the shortest etching time and minimal use of etchant chemicals. There is a sweet point in that compromise and you can reach it by experimentation. ...continue reading "PCB Making: 8. Etching"
...continue reading "PCB Making: 9. Tinning"
...continue reading "PCB Making: 10. Drilling holes"